C&L Supreme’s state of the art, 20,000 square foot facility is located in Des Plaines, Illinois, just minutes away from Chicago’s O’Hare International Airport and several major interstate highways. The current facility is situated on 2.7 acres, providing the capability for expansion to more than double its current size. C & L Supreme Mfg. lives by a quality management system that is designed to continually improve the effectiveness and efficiency of the organization’s performance, influenced by the needs of our customers. 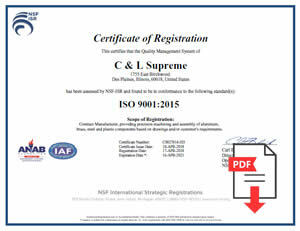 C&L Supreme strives for zero defects and was one of the first manufacturers to receive the latest ISO 9001:2015 certification. 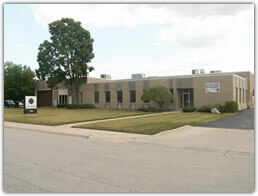 C&L Supreme offers extensive manufacturing capabilities through its wide range of equipment and technology, including more than 30 CNC machine tools and a host of primary and secondary operations, including external OD grinding, saw cutting, roller burnishing, thread rolling and parts cleaning. Our material handling capabilities support component production from carbon and stainless steels, aluminum, brass and copper in coiled rod, bar, plate, forgings and castings.